Over 30 years ago, the US Government required clip-on weapon sight solutions that would meet the expectations of military users in fielded conditions. C. Reed Knight, Jr. had already established Knight’s Armament Company (KAC) as a leader in research, development and rapid fielding of complex requirements for the special operations community. In the early 1990’s, the Army’s Test Lab NVESD and JSOC approached KAC requesting an interim solution while Army’s Integrated Night Operations Devices (INOD) systems were perfected. The INOD concept ultimately culminated in weapon sight technology. In 1994 JSOC funded a program that resulted in the NADS (Night Augmented Day Sight). This system mounted above the day sight and was stable under weapon shock up to 50cal. These devices were engineered to be adapted to the day sights. It was during the development and testing of the NADS systems that Mr. Knight first imagined developing an inline clip on weapon sight. Rapid improvements in followed, including an inline solution allowing placement of the clip on weapon sight directly on the rail and the incorporation of a unique KAC patented boresight technology (BAR). This allowed the night sight to be used in front of an existing DVO without ever losing boresight or requiring any DVO boresight adjustments. Together, the BAR patent and the single throw lever mount created a strong force multiplier for Clip-On WS capability, requiring zero boresight adjustment when a WS was moved from gun to gun to gun. This capability began to reduce, if not eliminate, the need for the War fighter to carry multiple special purpose and mission specific guns. These systems were built and sold to the U.S. Army in the mid 1990’s. The AN/PVS- 22, AN/PVS-26, AN/PVS-27, AN/PVS-29 and AN/PVS-30 Clip-On Weapon Sights are next generations of those early production sights. The value of the clip-on weapon sight was originally underestimated by the US Government. Specialized user groups needed a solution that maintained the position of their day scope rather than remove the day scope and attach in its place a larger, more complicated device that degraded their usual day resolution simply to add night capability. These warriors spent thousands of hours honing their skills with the weapon platform (rifle and day scope) and refused to remove it for what they felt was a less optimized device. The ability to add a “Clip-On” device, that added night time capability without disturbing the original weapon platform, suited their needs much better. Over time, the “Clip-On” device met all the users’ requirements without disturbing their established rifle and day scope setup. Using a boresighted “clip on” system allows the shooter to maintain his zero (relationship between the rifle and day optic) with no additional changes or adjustment. That is to say the eye relief, cheek-weld, shooting dope and characteristics of the weapon, including the bullet strike point, remain the same. Every KAC Clip on Sniper Night Sight (CoSNS) uses factory set wedge-prisms (US Patent 7,142,357 B2) that compensate for any image shift in the day optics caused by manufacturing and assembly errors or wear in the night optics over time. The advantages of this Knight’s inline approach are trust/confidence, precision, speed and familiarity. Knight’s Armament Company and its KnightVision™ continues its unrelenting focus on research, design and production of Weapon Sights and rifles adapted to Special Operator requirements. These design improvements include the constant attention for reduction in size and weight, increased power and extended range performance. From its humble beginnings of developing a temporary solution in the early 1990’s, KAC now has an entire Family of inline Clip-on Universal Night Sights (UNS) including IR and I2 ‚’in-line‚’ types of night vision devices. 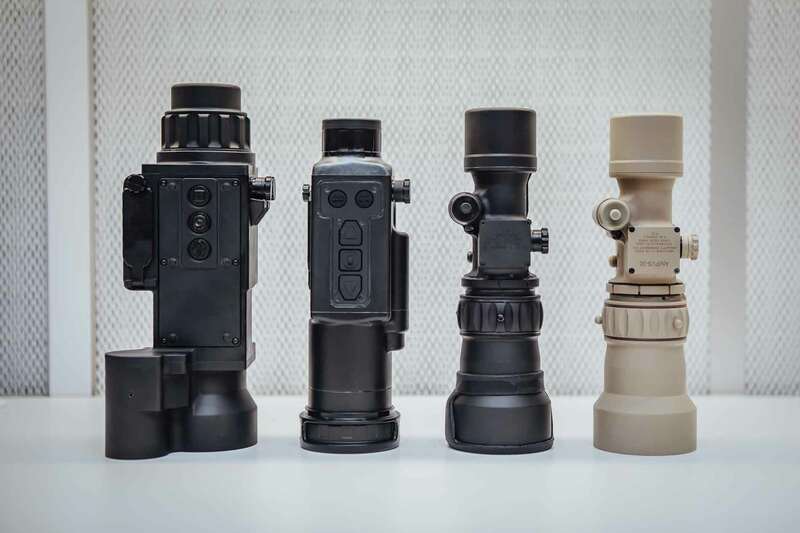 All KAC night vision devices are designed to be positioned in front of conventional ‚’day scopes’ on the user’s rifle providing the user with the same night time zero as their unaided day scopes. The UNS products can be fitted onto most welded weapons and/or day optical sights. This innovative design and engineering solution has been awarded with milestone US contracts as their longer range version of USSOCOM‚’s UNS. All KAC’s UNS products are manufactured in-house at KAC’s Titusville facility to ensure the highest quality for these state-of-the-art electro-optical units.